Last weekend I went to see the band Erasure who played at the Sound Academy (used to be the Docks) here in Toronto. It was the first concert I had been to in a few years and was it ever good! Andy Bell can really sing (still) and they put on a fun show. 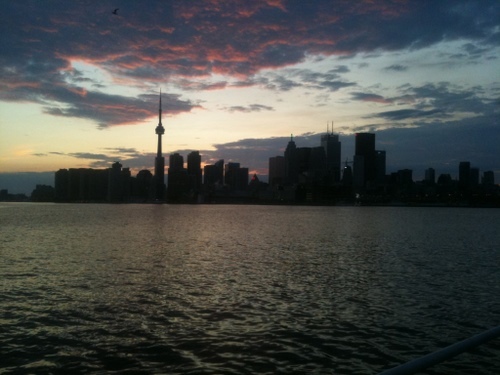 The venue is right on the Toronto harbour and has a great view from the patio. BrokeTO wrote a funny post protesting some of the crappy money saving advice on the internet. It’s hard to cut back when you already have. Preet Banerjee wrote an excellent post about mutual fund survivorship and backfill performance enhancing tricks. Well worth a read. Mimi Lee, a financial advisor has some warnings about investing with the banks. She wrote this in response to a comment on my Globe & Mail online chat, where I recommended people set up RESPs at a bank. Scott Adams wrote a great post on applying systems to your life. This article about client segmentation was written for financial advisors, but might be useful for clients in case they wonder if their advisor has “fired” them. Business Insider says that Canada is not a good place to invest. Retire Happy explains living benefit insurance. Michael James is sad that the Motley Fool website has come full circle. Unfortunately, there is a lot more money writing about get rich quick investing ideas than there is in passive investing. The Oblivious Investor came up with a better option to buying equity options. Canadian Capitalist discusses Vanguard’s best practices for portfolio rebalancing. Echo wrote about mutual fund fees: the high cost of Canadian funds. Million Dollar Journey says it’s time for a financial checkup. My Own Advisor discloses his favourite international equity ETFs. Are You Missing Out on These Credit Card Perks? Was that an outdoor concert? Thanks for including me in this weeks round up! BrokeTO’s rant was funny. I find all this recycled advice tiresome as well. Thanks for the mention Mike. Cheers! Wow… did that ever bring back memories. Ah, The Docks, err, Sound Academy. That place brings back many, some, ok, just a couple of memories (of what I can remember) of my young professional days in Toronto. Wait, you saw Erasure? When was this post written? 1986?